I was all set to make this week’s edition about centres. The guys who snap the ball to the quarterback. Then Calvin Johnson used all of his power-ups and cheat codes. So I’ll be writing about him now. There is no need to gush about the statistics themselves. Johnson racked up 329 receiving yards, which is just 7 yards shy of the NFL single-game record (which, as you obviously know, belongs to Flipper Anderson). You know the stats. I’m more concerned with how he was able to do this, and I’m curious about whether there is any possible way he can duplicate this kind of game, and actually knock Flipper out of the record books once and for all. I love this video because I have no idea what exactly Harrison did that made Harper fold like a cheap suit. He stutter stepped, he may have thrown a head fake, but Harper was lost and Harrison was in acres of space in about 2 seconds. There are a lot of guys in the world who look like premier wide receivers. There are only a handful who actually are. And the difference, I think, is somewhere in that 5-second clip. Calvin Johnson looks like a premier wide receiver. He is also THE premier wide receiver. He is tall, fast and strong, all traits that can not be taught. But so are dozens of other NFL wide receivers. On Sunday, Johnson put all of his physical gifts to use on this catch. He out-jumps two Dallas Cowboy defenders and is close to escaping a tackle and scoring a touchdown. Born to play wide receiver. It’s one thing to be a freak of nature, but Johnson is also able to play the position in a cerebral way. 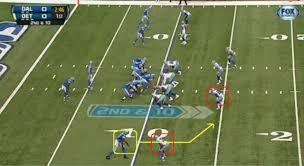 Precise routes and knowledge of opposing defensive schemes allow Johnson to find space in either zone or man coverage, as he did all over the Cowboys. Here’s a perfect example of Johnson’s precision, especially where it counts. This 2-yard touchdown pass requires excellent timing and the ability to keep the cornerback at bay by faking towards the back corner of the end zone before stopping and turning to receive the pass. It seems odd that of all the yardage Johnson gained, his only touchdown of the day came on a 2-yard slant. He was also stopped short a couple of times by the Cowboys’ secondary. We know Johnson is a physical beast who is also an intelligent receiver. That combination makes him among the best in the league. 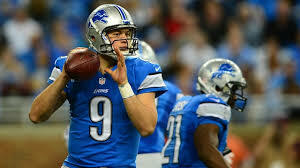 He plays with a competent quarterback in Matthew Stafford, and his offensive teammates have some talent. This season’s addition of Reggie Bush to the Lions’ backfield created a real threat that precluded constant double and triple teaming of Johnson. Maybe it’s also worth talking about Dallas’ defensive scheme tossing dudes on the field. How can you let a guy go off like that on you? It’s not like Johnson snuck up on the Cowboys, some surprise rookie or secret weapon. He’s been among the league’s best for at least four seasons. Here’s a highlight package of Johnson’s day, and the thing that stuck out to me was how often he was split out wide in single coverage, with no safety help over the top. Brandon Carr is a respectably good cornerback, but that is just not enough to control a guy whose nickname is Megatron. They don’t just give out nicknames like that. In short, the Cowboys allowed Johnson to go crazy on them, to the same degree that Johnson and Stafford earned it with route running, timing, accuracy, and all that other stuff I mentioned earlier. Acres of space for Johnson to roam. I should also bring up the fact that the Lions were trailing for about three quarters of that game, forcing them into a ton of throwing situations. Had the Lions held an early lead, you better believe that Reggie Bush would have seen a lot more of the ball, and we might be talking about Dez Bryant’s massive game instead. What we saw on Sunday was the perfect storm for a receiver. Remember Flipper Anderson? On the day he set the NFL record, his team was also playing from behind. Anderson, unlike Johnson, was not a well-known star in the league, and thus the defense paid him little attention. 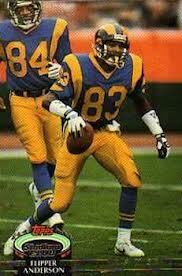 He was also playing with a competent quarterback in Jim Everett. Willie “Flipper” Anderson had a better game than Calvin Johnson, once. Is Johnson, or anyone else for that matter, likely to have a game like this again this season? Probably not. It would be virtually impossible to predict a record-breaking, or record-approaching, game like that. It’s unlikely that Johnson sees continual single coverage again for a while. There was another fantastic wide receiver game on Sunday, and it belonged to Marvin Jones of the Cincinnati Bengals. He had 122 yards and FOUR touchdowns. You’ve never heard of him, and you likely won’t remember his name in four weeks. But, with soft defense, a competent quarterback, and the physical gifts necessary to be a wide receiver in the NFL, he had the pieces in place for that quality of game. There may be a larger trend here as well, one that I mentioned a few weeks ago when talking about tight ends; the passing game is much more vital to the NFL now than ever before, and as such, the opportunity for receivers to put up gaudy stats is more and more common. I’ll be sure to dig a little deeper on this before jumping to any conclusions, but its certainly something I have been considering. The point is, we have no idea who might reach a receiving milestone next. Just don’t bet against Megatron. And for God’s sake, double cover him!